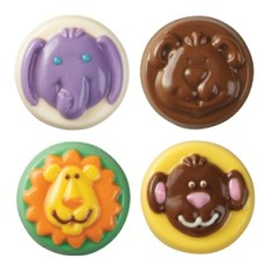 With Cookie Candy Molds and easy-melting Wilton Candy Melts®, it's a breeze to add a great tasting and colorful candy design to your favorite cookies. Just brush colored candy details in the mold, let set, then add more melted candy and position your cookie in the mold. Great for sandwich cream cookies or any round cookie 2 in. diameter or less. 4 designs, 8 cavities.